Although the Society was originally formed in 1868, it was not until 1926 that the AOS was incorporated in the state of New York as a domestic not-for-profit organization (“AOS-NY”), to assume all the educational activities of the American Otological Society including those activities relating to hosting annual meetings and conducting research activities involving studies related to otosclerosis. Based on said activities, AOS-NY was transferred to Illinois on August 30, 2002 and was granted 501(c)(3) status. The society was reorganized in Illinois as AOS, Inc., a “gross receipts charity per 509(a)(2) of the tax code. To retain this designation, AOS, Inc. must not exceed one-third of its annual support through investment income. Therefore, three days later, an additional 501(c)(3) corporation, the AOS Research Foundation (AOS/RF), was formed. This is a “Type II supporting organization” per 509(a)(3) of the tax code, which is not subject to limits on investment income, and exists to support AOS, Inc. and its charitable mission. The assets of the Society designated for research were then transferred to the AOS/RF thereby dividing the educational mission (AOS, Inc.) from the research mission (AOS/RF). The AOS, Inc. co-publishes “Otology & Neurotology”, a journal devoted to otological and/or neurotological research, services, and/or basic science. The co-publisher of the Journal is the American Neurotology Society, Inc., also a 501(c)(3) organization. The Journal is a leading international publisher of professional health information for physicians, nurses, specialized clinicians and students. As the foremost journal in its field, it has become the favored place for publishing the best of new science relating to the human ear and its diseases. The broadly international character of its contributing authors, editorial board, and readership provides the Journal its decidedly global perspective. Research in the field of medicine continues to have a direct impact on improved services to medical patients. There is a specific need for research in otology and related disciplines because of the existence of disorders and diseases directly related to these fields. The American Otological Society Research Foundation (AOS/RF) was established on June 22, 2006, by American Otological Society, Inc., an Illinois 501(c)(3) organization to, promote and sponsor investigator-initiated research and training. Effective July 1, 2006, AOS, Inc. transferred all its assets involving research activities to the Foundation. The AOS/RF offers four types of grant mechanisms, the Research Grant award, an award for Clinical Trials, a full-time Research Training Fellowship, and a Clinician-Scientist award. 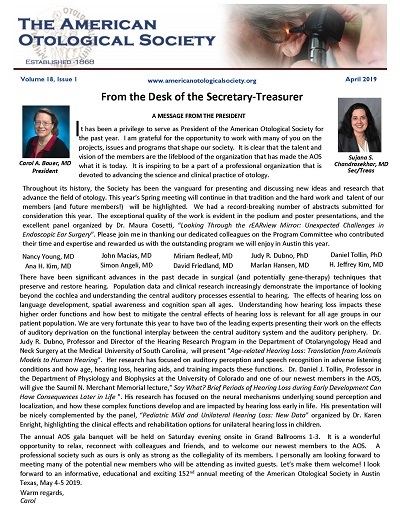 AOS/RF grant awards may involve research on any topic related to ear disorders. The research need not be directly focused toward an otological disease, but may explore normal function of the cochlea, labyrinth or the central auditory and vestibular systems.